Cancer immunotherapy has ignited a firestorm of new drug compounds that target novel tumor markers that activate patients’ immune system to destroy various cancer cell types. These therapies have provided remarkable success; however, they are expensive to produce and administer, with a percentage of patients showing little to no therapeutic efficacy. Now, scientists at Kyoto University have found unique genetic alterations that could indicate whether expensive immune checkpoint inhibitors would be effective for a particular patient. Programmed death ligand 1, or PD-L1, is a protein that conveys to the immune system not to kill a particular cell. In this new study, the research team reports that genetic alterations affecting a part of the PD-L1 gene increase the production of the protein, allowing cancer cells to escape detection by the immune system. Antibodies that target PD-L1 or its receptor PD-1 have shown extraordinary therapeutic effects for many cancer patients—even for those who are terminally ill. Because the treatments using such antibodies are extremely expensive, the Kyoto scientists were keen to find a biomarker that could predict the effectiveness of these drugs for individual patients. 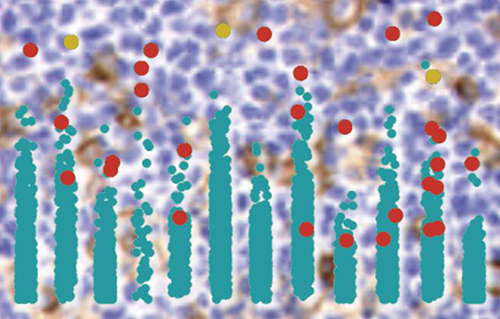 “We identified PD-L1 structural alterations affecting the 3' untranslated region of the PD-L1 gene in 27% of patients with adult T-cell leukemia/lymphoma by analyzing next-generation sequencing data,” noted senior study author Seishi Ogawa, M.D., Ph.D., professor in the department of pathology and tumor biology at Kyoto University. Due to the success of their initial finding, the investigators searched for similar structural alterations in sequencing data from a total of 10,210 samples deposited in the Cancer Genome Atlas.